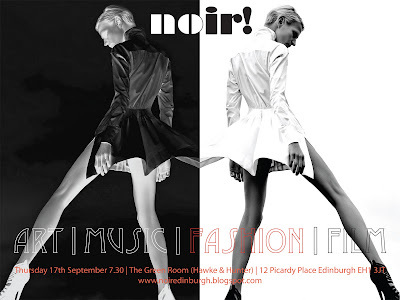 Join us on 17 September for Noir! number three, celebrating the best of Edinburgh's most creative boutiques in a fashion show and party that rocks. After two successful nights, Noir! announces its most ambitious project yet: Chapter Three – Fashion. Noir! is an expanding concept that started as an exhibition and party at Hawke & Hunter featuring the work of artist and founder Jonathan Freemantle. The success of the first night prompted organisers to stage a second chapter at the same venue inviting a group of artists. Hawke & Hunter’s new venue, The Green Room, launched in August, is an ideal setting for number three; a grand fashion show and exhibition showcasing Edinburgh’s top models, designers and boutiques. Noir! was formed by a South African painter, a Dutch model, a Scottish DJ and a musician with the intention of throwing a party they themselves wanted to be at. Chapter Three – Fashion will be the biggest Noir! yet, with over 20 collaborators involved. Noir! loosely bases itself on Andy Warhol’s Factory, particularly in the sense that projects are shown as works in progress. “I want it to be like having a party in an artist’s studio, like being in the cutting room with a filmmaker, where all the excitement of the creative process is still fresh,” says Freemantle. Modelling and choreographing the show is Anna Freemantle, now Edinburgh based after an internationally successful career that included work for Louis Vuitton and Versace. “Edinburgh is on the international map thanks to the festivals but this focus has never fully extended to putting fashion under the spotlight. We want to shake the stigma that Edinburgh is a safe, conservative city. There is a daring, creative side that is quintessentially Edinburgh that seldom gets the attention it deserves and we want to bring that to the surface,” she says. Each boutique is one-off and special to Edinburgh; they represent the very best of what is unique to the city. The show will be graced by internationally celebrated models and supported by a world-class back stage crew. The boutiques involved are Totty Rocks, Arkangel, Godiva, Concrete Wardrobe, Kakao by K, 21st Century Kilts, Joyce Paton and Boudiche. Hair by Boombarbers and makeup by Carrie-Anne Taylor. An installation by painter Jonathan Freemantle will also be on show as well as sculptural mannequins dressed by each boutique. A big thank you to our principal sponsors and hosts, The Green Room at Hawke & Hunter - Edinburgh's sharpest new venue.